My wife’s parents just earned their Resident Alien status, and plan to spend half the year in the United States. They would like to lease a car, but have no Social Security number, established credit or pay stubs to show. They do own a condo (no mortgage) and have savings. Could the condo be used as collateral in leasing a car, as I would prefer not to be a co-signer. Brett, this is tough to work around. In a lease, the car itself is the collateral. 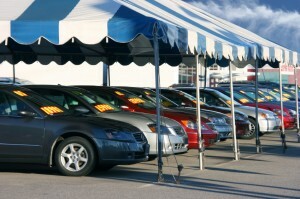 If the lease or loan is not paid, the vehicle is repossessed. Unfortunately, putting a lien on a condo in order to lease out a vehicle wouldn’t be appealing to a bank. But your in-laws do have a few options. You say they have savings. They could put a larger down payment, which can help the lender feel better about bad or no credit. A large down payment generally isn’t advised when leasing — it lowers the monthly payments, sure, but if you were to get in an accident within the first few months of the lease, you’d risk losing your entire down payment. But in the case of your in-laws, this may be their only leasing option. Unfortunately, it may mean paying the entire lease term upfront. A better option? They could forget about leasing, and use some of that savings to purchase a good used car. That’s what I would recommend — if they purchase the car outright, they avoid the credit issue altogether. And if that money is just sitting in a low-interest savings account, and they have emergency savings as well, it may make sense to put it to use here. But if they’re dead set on the lease, it’s going to take some leg work. They should shop around by calling several dealers and explaining their situation. Some dealers may be willing to negotiate with their lender to work it out – they want to lease the car, after all. Your in-laws need to be able to prove residency and provide a valid address. Mailbag Monday: Buy or Lease for Business? Ask Jean: Buy or lease?